Ever so often, God gives us glimpses of the riches of Heaven that await us. These little insights come in an odd assortment of colors, sizes and shapes and from sources we couldn’t dream up. Today, as my daughter-in-law, Savannah, and I took our morning walk, I noticed something glimmering on the ground. 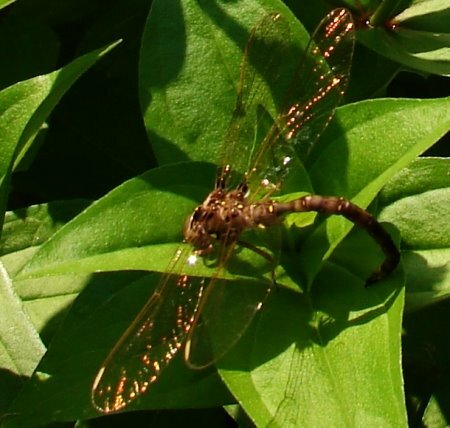 We stopped and looked closely to find a beautiful gold dragonfly that was barely moving. It was perfect in every way but seemed to be dying, so I picked it up and brought it home. The picture above doesn’t do the shimmery gold wings justice. As I photographed this beautiful insect, I thought about the beauty of our heavenly home. I know we can’t begin to imagine the glory and splendor of such a place, but sometimes, God gives us a peek…just to encourage us! Congratulations, on your winnings! I love dragonflies. I am grateful for all the mini-blessings that God shows His power through.